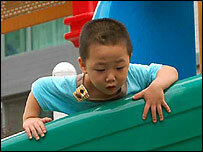 BBC NEWS | Asia-Pacific | Has China's one-child policy worked? In the first of a series of pieces on China's one-child policy, the BBC's Michael Bristow looks at whether the country's controversial regulations are working. China's family planning policy has prevented 400 million births, officials say. Since the regulations were introduced in 1978, China has kept its population in check using persuasion, coercion and encouragement. And it looks likely that, nearly 30 years after the policy was first introduced, it will not be relaxed to allow couples to have more children. Many Chinese and foreign academics believe this is a mistake and will result in a number of serious demographic problems in the future. At a press conference earlier this year, Chinese officials were keen to declare the controversial policy a success. "Because China has worked hard over the last 30 years, we have 400 million fewer people," said Zhang Weiqing, minister in charge of the National Population and Family Planning Commission. "Compared with the world's other developing countries with large populations, we have realised this transformation half a century ahead of time." A team of independent Chinese and foreign academics, who this year completed what they say is the first systematic examination of the policy, agree that China has managed to limit its population growth. But team leader Wang Feng, of the University of California, Irvine, says this reduction is mainly due to a fall in the fertility rate in the 1970s, rather than any more recent initiatives. During the 1970s, China began encouraging delayed marriages, longer intervals between births and fewer children. "The total fertility rate - the number of children a woman is expected to have in her lifetime - was reduced from over five to slightly over two," Prof Wang says. All this happened before the current family planning policy was introduced in 1978. The fall in fertility rates is also, at least partly, due to improving social and economic circumstances. In other East Asian countries, such as Thailand and South Korea, modernisation has led to women having fewer children, and yet these countries do not have strict family planning policies. But Professor Wang does admit that China's family planning policies since 1978 have helped reduce the fertility rate further and contributed to a change in attitudes. "A lot of people simply don't want that many children. People have accepted the policy," he says. This is particularly true in urban areas, where most couples interviewed by the BBC say they are happy with just one child. Beijing mother-of-one Zhao Hui, who has a four-year-old daughter called Zhang Jin'ao, says she has never wanted more than one child. "One child is enough. I'm too busy at work to have any more," says the 38-year-old, who works in the housing sector. "It wouldn't matter what my financial situation was or what the government regulations were, I'd still only want one child," she adds. Most of her friends, she says, think the same way. But there is a more sinister aspect to this policy, which is sometimes employed to make women less willing than Ms Zhao accept the rules. Activist Chen Guangcheng was sent to prison last year for exposing what he says were over-zealous health workers in Linyi city, Shandong Province. He says they illegally forced women to have late-term abortions and be sterilised. 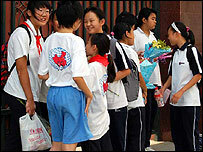 China also faces profound and widespread demographic problems because of its family planning rules, according to some. Chinese officials say the current fertility rate is between 1.7 and 1.8 births per woman, well below the 2.1 births needed to keep the population at a stable level. Overseas experts dispute this figure; they say the fertility rate is even lower and stands at 1.5. This will result in an increasing proportion of older people, a smaller workforce to look after them and a disproportionate number of boys to girls. There are other problems too. China might have restricted its population growth, but this has not always helped solve wider problems, as was envisaged when the policy was first introduced in 1978. Reducing the number of people, for example, does not automatically help the environment, as China has found. Prof Wang says the policy needs to be relaxed if China is to solve some of these problems. There are at least a few people inside China who agree with that assessment. During this year's parliamentary session in March, 29 members of the Chinese People's Political Consultative Conference, a government advisory body, suggested allowing couples to have two children. But that suggestion will probably fall on deaf ears, at least until the end of the government's current five-year plan, which ends in 2010. At the press conference earlier this year, Minister Zhang said there was not the "slightest doubt" about the need to continue with the policy. China might face serious consequences because of that attitude in the not-too-distant future.